Online test over Local Networks. 9 grade computer science evaluation. IT test. "Local Networks Test" is a free online knowledge level test for IT and Informatics 9 grade, the structure of Local Area Networks with school mark generation. A small 18 question online test for desktop computers, laptops and tablets, which may be solved online in the web browser. It is cumulative with the LAN Puzzle. How to play Local Networks Test. Read carefully the question and select one of three answers. Grades more than B rewards +1 Knowledge Level. Class Subject: LAN structure exam. 1. What does LAN means? 2. What does MAN means? 3. What does WAN means? 4. What does SAN means? C) Wireless Local Area Network. 5. What does WLAN means? 6. What does CAN means? 7. What type of cabel is needed to connect 2 computers? 8. Select the correct IP adress. 9. Select the correct subnet mask. A) Connections between computers are made with telepathic cards. B) Connections between computers are made with LAN cards. C) Connections between computers are made with MAN cards. 11. Select the correct statement. A) LAN cards do not needs drivers to work. B) LAN Cards are unbreakable part of the main board. C) LAN cards needs drivers to work. 12. Select the correct statement. A) LAN cards can be used to play multiplayer games. B) No LAN card is needed to play multiplayer games. 13. Select the correct statement. A) Every computer have a LAN card. B) LAN cards are software. C) LAN cards are hardware. A) I can access the internet without a LAN card. B) To access the internet I need a LAN card. C) The internet is a top secret US government experiment for zombies. 15. Select the correct statement. A) LANs can maintain connections with other LANs via leased lines. B) LANs can not maintain connections with other LANs via leased lines. 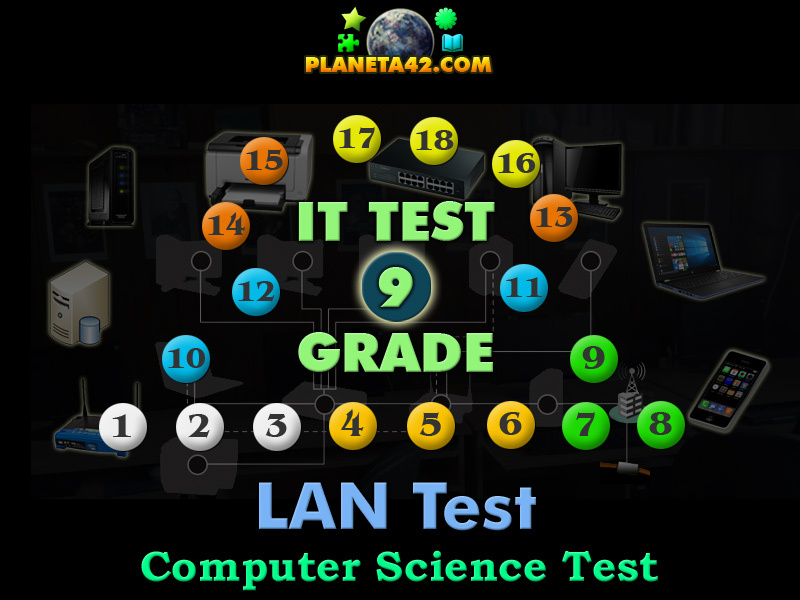 C) LANs can not maintain connections with other LANs across the Internet. 16. Select the correct statement. A) Early commercial LAN technologies were developed in the 1990s. B) Early commercial LAN technologies were developed in the 1980s. C) Early commercial LAN technologies were developed in the 1970s. 17. Select the correct statement. A) Conecting more computers in a network is done by buttons. B) Conecting more computers in a network is done by switches. C) Conecting more computers in a network is done by levers. 18. Select the correct statement. A) Every local network need a server. C) Every local network needs at least 2 servers. Labels: IT Tests , Computer Science Test , Flash Games , Online Tests , Online Exams , Free Online Tests.